So far this week, two quick moving areas of low pressure coming out of the prairie provinces of Canada (Alberta Clippers) have impacted North Dakota. Last night’s clipper was in south central Iowa at 8:00 AM this morning. 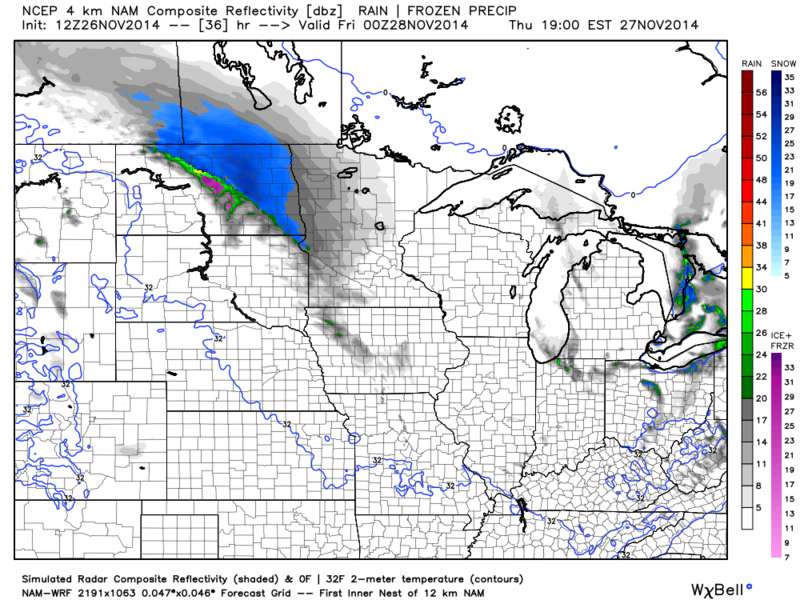 The heaviest snow from this event will be in southern Minnesota. In North Dakota many of the snow totals were in the 1 to 3 inch range in central and far southeastern parts of the state with some localized higher totals, with less than an inch elsewhere. Both Fargo and Grand Forks recorded around 0.5 inches, with Bismarck near 2 inches. High pressure is building in behind the clipper and today will be a dry day with the exception of some flurries with some left over clouds. Where the sky did clear after midnight, or even around sunrise, the temperatures dropped quickly. 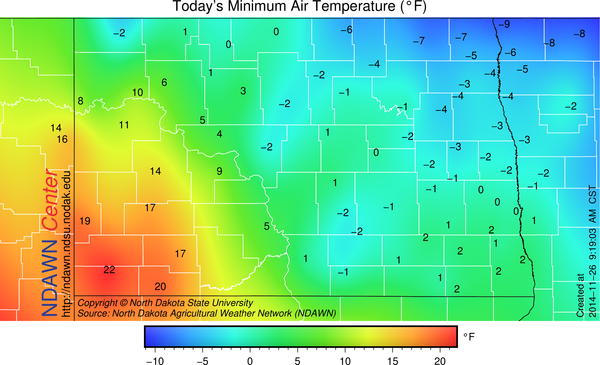 Minimum temperatures across the NDAWN stations were below zero, especially in the eastern part of the network. Outside of some flurries, today is expected to be dry, but another clipper (#3) will be moving into the area on Thanksgiving. The snow will arrive tomorrow before noon in the western one-third of North Dakota and then move easterly across the state then into northern Minnesota. The highest snow totals continue to look to be near and north of Highway 200. Although all or almost all of southern North Dakota will record some measurable snow. The northern one-half of North Dakota recording 2-4 inches and the southern one-half in the 1 to 2 inch range with far southern North Dakota perhaps staying under 1 inch. After a very cold start of the day, especially in eastern North Dakota with temperatures well below zero, the clouds and snow will make for a huge recovery with temperatures in the 20s by later in the day. 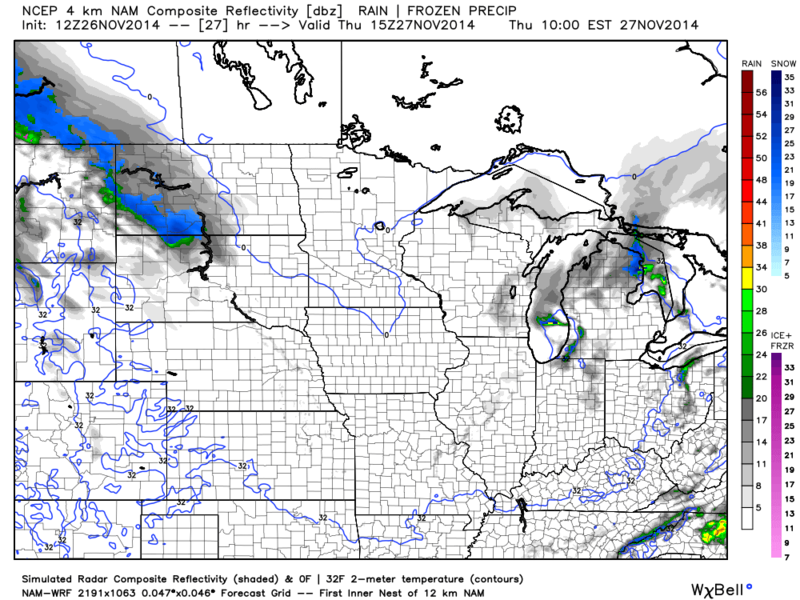 Western North Dakota after the snow ends could recover into the low to middle 30s. Friday should bring dry weather to most of the state of North Dakota with the exception of the far norther portions of northwestern and north central parts of the state. But Friday night into Saturday, yes, another wave of snow is expected. At this time near Highway 2 and northward will be the main areas impacted and snowfall could easily be in the 2-4 inches range once again. Then yet another disturbance may impact especially northern North Dakota on Sunday. With multiple waves of snow, travel will be impacted this holiday weekend. Today. A mix of sun and clouds with highs 10-15 degrees with some locations not even reaching that 10. So a cold day. Strong morning wind slowly relaxing this afternoon. Tonight, coldest night of the season for eastern North Dakota, then the snow with rising temperatures on Thanksgiving day. Next week, continued cold and the clipper machine temporarily breaking down for Monday through Wednesday, maybe Thursday of next week.